Cymbal Safe Case, Drum/Percussion Case, Gig Bag, or Cover from SKB. SKB Corporation has added a new cymbal case to its line of cymbal transport solutions. 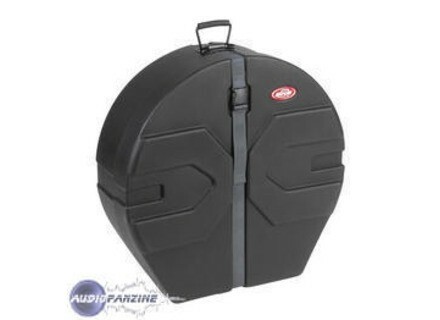 The 1SKB-CS22 Cymbal Safe is designed for transport of either cymbals in a gig bag or marching band cymbals that cannot be mounted on a spindle. The SKB Cymbal Safe is rotationally molded from Linear Low Density Polyethylene (LLDPE), designed to offer high durability and strength. The 1SKB-CS22 is a roto-molded D-shaped case design with molded in feet for upright positioning and stability. The case includes a patented Roto-X pattern for added strength, durability and reliable stacking. Sure grip handles with a 90° stop are designed for lifting and transporting. 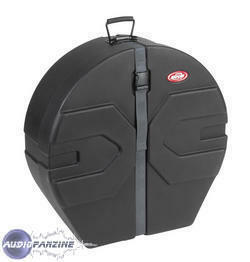 The new Cymbal Safe also includes a padded interior for added protection. The new 1SKB-CS22 Cymbal Safe is covered by SKB's guaranty. SKB's new 1SKB-CS22 Cymbal Safe will be available February 2009 from authorized SKB dealers with pricing TBA. Mapex Black Panther Special Edition Elm Mapex USA introduced the Black Panther Special Edition Elm Snare Drum.